At Mayo Clinic, we're lucky to have a variety of great stories to tell. Whether it's a patient story or an advancement in research, our Social & Digital Innovation (SDI) team typically works with our colleagues in media relations and the news team to tell it well and then distribute through our social media platforms and traditional media. Usually, there's quite a bit of advance planning, strategy, and coordination involved. But sometimes it's just as important to recognize and take advantage of opportunities that are already underway. This caught my attention. 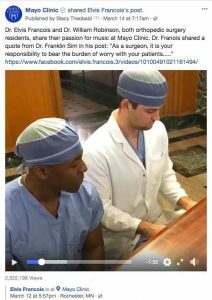 I clicked on the video and saw two orthopedic surgery residents singing and playing the piano in the lobby of Mayo Clinic Hospital, Saint Marys Campus. The song was beautiful! I thought it did have the potential to take off and that we might be able to help. I shared the video with our SDI team to start the conversation about sharing it broadly on Mayo Clinic’s Facebook page and we agreed to proceed. I reached out to the physician who posted the video to ask permission. Dr. Francois was more than happy for us to share the video. So we did, on Mayo Clinic’s Facebook page, about 36 hours after his original upload. Within a few hours, the comments and shares started to appear. The comments shared positive experiences at Mayo Clinic hearing the piano in the Gonda lobby and the calming, healing environment Mayo provides. Overall, our post received nearly 11,000 engagements, which contributed to the video reaching 2.3 million views, with 34K reactions, and 33K shares. Have you had an experience like this, where you saw an opportunity to help amplify an already good story on social media? Please tell about it and share a link in the comments below! 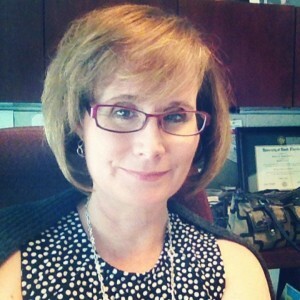 Margaret Shepard is a Communications Specialist for Mayo Clinic's Social & Digital Innovation team and is based on our Mayo Clinic campus in Rochester, Minn.
Mayo Clinic is doing awesome with the viral videos lately. At Mayo Clinic, we're lucky to have a variety of great stories to tell. I saw that one and shared on my personal social!